By Brent Balkcom, MPM, PSP, Security Control Systems, Inc.
Chris Vanderbles, Manager of Technical Services, Security Control Systems, Inc. When it comes to security, you can’t put a price tag on a well-integrated system that meets your needs. In a healthcare setting, even more logistics must be taken into account, from maintaining a sterile environment to complying with HIPPA standards. So when it’s time to hire a security systems integrator for you next project, what should a healthcare or hospital security director look for? A patient would not trust a first-year surgical intern to do brain surgery, just as a healthcare security director should not trust an inexperienced integrator to install a security system in a place as critical as a hospital environment. An experienced integrator knows that open communication must take place between the integrator, the IT department and the security department to ensure a successful installation of any system, whether it’s an enterprise level access control system or IP-based video system. Some states and jurisdictions also require a license for security integrators. Having an integrator who is versed in working with multiple departments will make the road to installation much smoother, while simultaneously creating a sense of trust within these departments. Having an integrator that understands every step of the process will make the installation process easier. Installing an access control system or video surveillance system in a business office is much different from a security project in a hospital. On top of the typical need assessment, hospitals come with an added level of requirements. Integrators must have a strong understanding of HIPPA laws. A camera actively viewing a patient area must be secured and encrypted. In addition, certain areas where integrators could be working must be kept sterile with containment carts that rise to the celling and use positive pressure to filter out anything that might fall to keep the area dust free. On top of that, every hospital has its own permit process that lets them know where the integrator will be, what they’ll be doing, and for how long. Hiring an integrator who has not only knowledge of, but experience with juggling these different requirements will further ensure you are in safe hands. Online demos can be altered. The only way to be confident that the system you and the integrator have agreed on will work as expected is to see it in action. A reputable integrator should set up multiple monitors, servers, cameras, demo panels, demo doors, and show you exactly how a specific system will work. A lot of companies talk big, but it’s another thing to deliver. If you were going to hire an electrical technician, the best way to test their abilities is to put a panel in front of them and ask them to wire it. The same is true with integrators. The bottom line is, eventually you will have to take a leap of faith and choose an integrator. It’s important to keep in mind all that goes into choosing the right one, and to recognize that you get what you pay for. While you may need to go with the lower bid for some budgetary items, selecting an integrator should not be one of them. The post Healthcare Security: What to Look for in a Security Integrator Partner appeared first on Security-Net Blog. When video analytics come to mind, we often think of it in the traditional sense: a camera detects an object or a person and alerts you if something is out of place. However, as the security market becomes even more competitive, companies are developing advanced algorithms to stay current and increase profitability. To combat the lower price point of surveillance cameras overseas, some companies are building proprietary algorithms directly into the camera, so as soon as it’s removed from the box, it is ready to use. Immediately, that camera can detect if motion is present, and automatically records video 30 seconds prior to, and following, movement, as opposed to continuously. To put it into perspective, normal surveillance cameras would record for 24 hours a day, capturing roughly 12 hours of motion during that time. This analytic reduces storage needs by 90% but costs upwards of $1800 per camera, as opposed to $800 without this feature. This has been used in casinos where laws require keeping video surveillance on file for a year. As opposed to using five petabytes of storage, it is reduced to one. All you have to do is flip a switch and this feature is activated. We are also seeing an increase in video analytics in retail settings. Some software can detect if a customer is lingering around a certain section of the store, and sends an alert to let the employees know to assist the customer or investigate the suspicious activity. Other software can detect if a cashier prints a double receipt for a return when there are no customers present to contest internal theft. Still, there is an ongoing race among security professionals to see who will create the next big thing. Most people are familiar with Apple Pay and Google Wallet, but some innovators want to eliminate the need for a phone or wallet while shopping by using facial recognition technology. In this instance, video analytics would allow you shop throughout the store, make your selections, and walk out without any interaction with a cashier. The software knows what you took and charges you accordingly by matching your face to your account. The metadata in the recorded video is analyzed multiple times, from the moment the customer enters the store, to after the customer leaves. By analyzing live and recorded videos simultaneously, the software can determine the required action going forward. In this case, the action is to charge the customer’s account. This is next level in video analytics. Although advanced analytics are more costly, efficiency and long-term savings result from the investment. Video analytic technology has improved drastically and will continue to evolve to provide end users with valuable information and tools to increase profitability. The post Video Analytics: From Surveillance Cameras to Facial Recognition appeared first on Security-Net Blog. Active shooter technology, developed over the past few years, has become a valuable tool that many security professionals are giving more consideration to, due to the recent tragedies that we see in our society on a regular basis. Referred to as gunshot analytics, this emergency technology often includes integrations between different security systems to quickly alert and protect people in an active shooter or armed robbery situation. Picture this: someone walks into an office building with a firearm. Upon discharge of a weapon, the active shooter software’s sound detector picks up that incident and a map of the facility pops up on each associates’ monitor, while simultaneously alerting central station, for an immediate police dispatch. The monitor shows what part of the building the shooter occupies. As the person moves throughout the building and fires more shots, the map updates in real time. The system alerts people of the danger, while giving them instant updates to choose the safest course of action. Depending on their location in relation to the gunman, this might mean hiding or fleeing altogether. What’s interesting about this technology is that it can be linked to other systems, such as an access control system, to further ensure optimal safety. The moment the weapon is discharged, a building can go into automatic lockdown mode either by zone, floor or include the entire building. This response requires no human intervention. Discreet in appearance, the technology can work in a variety of vertical markets, including providing full coverage for a large office complex to helping to protect a defined high-risk area such as a hospital emergency room or a high-end retail store. In a situation with an armed robber, the setup might look a little different. If someone enters the store and discharges a weapon, the software can automatically alert a security operations center or central station. The home office can alert all other stores in the chain of the potential danger, and contact police directly. The gunshot alert can also trigger video cameras, making it possible for a central station to see what is happening immediately. When determining what active shooter technology is the right choice, an end user will have to evaluate several factors, including risk management, return on investment and budget. It comes down to whether or not an end user is willing to spend the money to implement the software and if they don’t, how vulnerable that leaves them. The investment can depend on how many detectors are needed and whether the system includes software mapping capabilities. It’s important that security, facilities, and IT directors become familiar with active shooter technology to fully understand how it can be deployed and benefit their company, employees and assets. Knowledge is the first step in preventing a tragedy. The post Security Professionals: Why Active Shooter Technology is the Talk of the Security Industry appeared first on Security-Net Blog. Extreme Conditions: Can Your Surveillance Cameras Handle It? Did you know that installing a surveillance camera directly in the sunlight can shorten its lifespan and impact how well it performs? Extreme weather situations, such as the hot sun or sub zero temperatures, can play a role as to whether or not a surveillance system will work properly when faced with these extreme elements. When installing a surveillance camera in the hot Southwest where the temperature can reach well above 100 degrees in the shade, it is important to pay attention to the placement of the camera. Is the camera facing West, so that it is in direct sunlight during the hottest part of the day, or is it facing North or South? West facing cameras will fail sooner than those located in the shade due to the extreme heat, so whenever possible it is important to place cameras in a location where there is an overhang on a building that can help shield the camera. Also, because IP cameras contain more components than their analog counterparts, these devices operate much like a computer and require a fan to help keep the elements cool. Some IP cameras available on the market today contain coolants to help maintain a proper temperature. The introduction of extreme weather enclosures has helped to ensure that cameras do not overheat when located in hot environments. Some of these enclosures include an additional fan to help keep the camera cool. For cold environments, the market has introduced cameras with a built-in heater or blower. Many cameras today include a temperature rating, which makes it easier to identify whether a camera can operate properly in sub zero temperatures. Outside of the extreme weather, other environmental elements need to be taken into consideration when installing a surveillance camera. For example, if a camera needs to be located in food processing facility and in its wash-down room, it is important to install an exterior grade camera that can handle repeatedly getting wet. Geographical areas that experience high winds, such as dust storms, tornados and hurricanes, should consider using sealed camera enclosures so that dust does not get inside the housing and impact the lenses and components. When it comes to installing surveillance cameras, a one-size fits all approach doesn’t always work in extreme environments. End users need to work closely with their security systems integrator to make sure their integration partner pays attention to the location of the camera, understands how hot or cold that area can get, factors in direct sunlight and tests products in the field to make sure they can stand up to the elements. The post Extreme Conditions: Can Your Surveillance Cameras Handle It? appeared first on Security-Net Blog. http://www.dacentral.com/wp-content/uploads/2018/05/DA-Logo-H-Web.png 0 0 SNBlog http://www.dacentral.com/wp-content/uploads/2018/05/DA-Logo-H-Web.png SNBlog2017-05-01 13:26:352018-06-01 16:59:52Extreme Conditions: Can Your Surveillance Cameras Handle It? Decisions. Decisions. Sometimes there are too many of them to make when you are managing a business. Who should you hire to provide IT support if you don’t have an IT person on staff? Which vendor should you use to provide office supplies? And, should you use a Mac or PC? These are just a few of the questions faced by business owners on a regular basis. Another question that may come up when it comes to security and managing facility access is how to select the right access control system, one that meets your business’ specific needs. There are many different types of access control systems available in the market today, such as standalone systems for one to four doors, mid-size systems that use single-factor authentication such as a keypad or proximity card, or large-scale systems that enable corporations to provide access to employees at multiple facilities in different states while using a single credential. Is it Easy to Use and Manage? Next to price, ease of use is typically the most important factor to take into consideration when looking to implement an access control system. Who is going to manage the system on the back end and add a new cardholder or revoke privileges when someone leaves the company? Do you need a system that offers a web-based interface so that you can remotely manage this task on your own, or do you plan to hire your systems integrator to oversee that service? Before you implement any access control system, it’s important to answer this question, otherwise the system can become compromised quickly if access rights are not updated on a regular basis. What Kind of Access Control Functionality Does Your Facility Need? It’s important to select an access control system that aligns with your business needs. Do you have a lot of employees that require access to an office or facility during the weekend or evening hours? Or do you need to keep a few key rooms, such as an IT server room or supply closet, under lock and key and only accessible to a few select employees? Also, will you need to monitor who comes and goes into the facility and need to create a detailed report on access times and who entered the facility? In some instances, a keypad can provide adequate security for a small business or to limit access to a specific area within a secure building. However, a keypad is not an ideal solution for high security areas because pins can be easily shared with other people. Instead, it is better to use a keypad and card reader combination to ensure multi-factor authentication. What Does It Need to Integrate With? Another thing to remember is that many entry-level access control systems do not offer third party integration. This means that if you plan to integrate video, elevator controls or an HR system in the future, it’s important to look beyond an entry-level system to future proof your system. While you might not need these exact integrations today, be sure to look out five years or longer as to what your access control needs may look like. If you expect to add more employees, for example, then an access control system with future capabilities may be the best option. An access control system that can integrate with Active Directory or PeopleSoft, for example, will enable you to integrate security functionality with human resources, so that when you onboard a new employee it becomes a single process to get them access to the building when they are entered into the HR system as a new employee. The same is true if that employee leaves the company – HR can deactivate their access privileges while changing the employee’s employment status. Price is always a challenging component because projects often are driven by a set budget, but many businesses also require a quality system that is reliable. Because the access control market offers numerous solutions, from standalone systems to IP-based systems, customers have numerous options from which to choose at a variety of price points. A keypad-based system may be more economical for businesses with only a few access points to secure. These type of systems eliminate the added expense associated with purchasing and replacing proximity cards, for example. However, a business that has multiple access points to secure, requires detailed after hours building access reporting or has a large number of employees may need to deploy a software based system, which is generally more expensive. No matter the size of your business or your budget, the security market offers many different access control systems from which end users can choose. The challenge is, of course, deciding which one. The post 4 Questions to Ask When Selecting an Access Control System appeared first on Security-Net Blog. In many ways, college campuses are much like a hospital environment because they both accommodate a large volume of people who require access to a number of public spaces. Today, many colleges operate on a 24/7 schedule, with buildings that are open and accessible to students nearly every day of the week and into the late hours of the evening. In these situations, it’s extremely important to ensure the proper security is in place to manage access to these facilities and to monitor those that are coming and going. 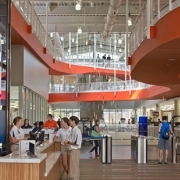 Auburn University faced these challenges with its Recreation and Wellness Center, which includes numerous workout facilities, indoor sports courts, an indoor track and an outdoor pool. At more than 240,000 square feet, the center has seen as many as 6,200 visitors in a single day. To gain access to the facility, students have to pass through a bank of turnstiles, which allows the university to keep track of the buildings overall use and specifically who is in the facility at any given time. An extensive surveillance system, with more than 120 cameras, provides full surveillance coverage inside the Recreation and Wellness Center to ensure that students are safe and to reduce theft of personal belongings. One area proved a unique challenge to Auburn University – its outside pool. The university wanted to ensure that if someone climbed over the fence and went into the pool at off hours they would immediately be alerted. To address this issue, the university installed an audible alarm system with a pre-recorded message that would sound if someone breached the pool perimeter. And, to help the university better identify incidents and those involved, it deployed a high-end megapixel camera with facial recognition technology in the lobby of the Recreation and Wellness Center. Now, the system can provide valuable information, such as the date and time and who was present, should an incident occur. Securing higher education facilities is no small task, but thanks to technological advances in surveillance and perimeter security systems, colleges and universities have access to more resources than ever before to protect students and faculty. The post A Comprehensive Approach to Protecting University Facilities appeared first on Security-Net Blog. © Copyright 2018 | All Rights Reserved | D/A Central Inc.